Take exit No.3 at Kayabacho station (Tokyo Metro Tozai line and Hibiya line). There are many exits, please take No.3. Go straight ahead and cross the bridge. Turn right into a narrow lane between a coffee shop (Café Veloce) and ATM. You will find our bikes in front of the TGCT office. 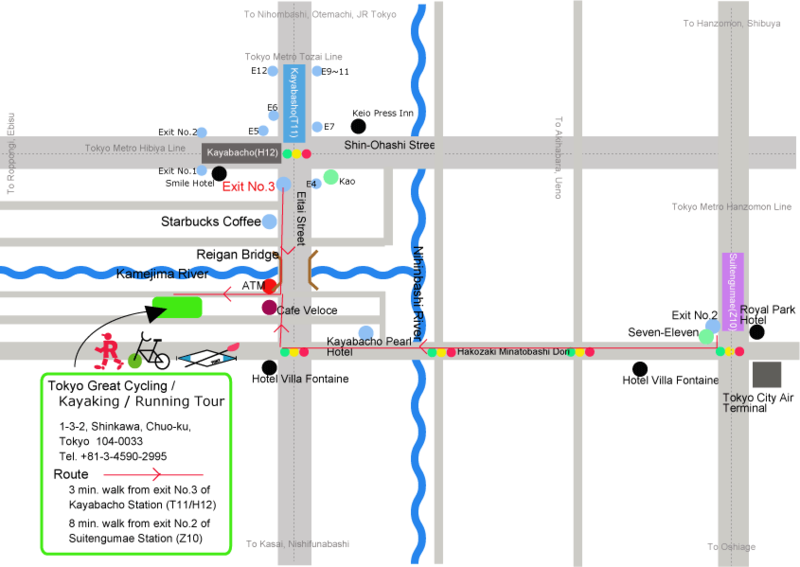 It takes about three minutes from Kayabacho station to our office. Kayabacho station is within 30 min. by train from major stations such as Shinjuku, Shibuya, Ikebukuro etc. Please find your way to Kayabacho station from your nearest station with a route finder service.